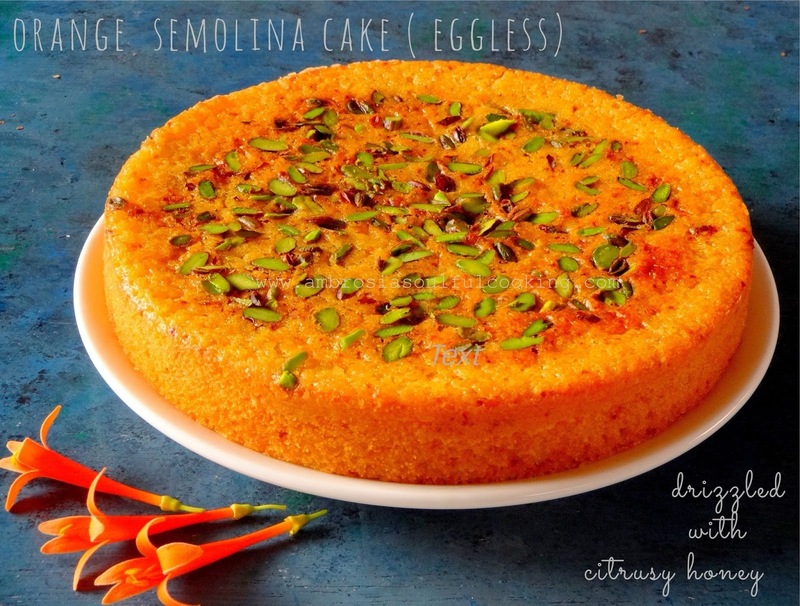 Eggless semolina cakes are our favourite. We bake them in different avatars. Low in fat and filling, a slice of semolina cake pairs well with a cup of tea. Hungry kids love to gorge on the big slices. We have baked semolina cakes many times. This cake is our favourite. The crust is a bit hard. When you pour citrusy honey, it becomes soft and flavourful. A pinch of turmeric goes into the batter to give that beautiful golden colour. In a large bowl, whisk together semolina, salt, and turmeric/custard powder. In another bowl, beat yogurt until smooth. Add sugar, oil and vanilla extract. Add orange juice and zest. Add semolina to yogurt mixture. Stir well, cover and keep for 15 minutes. The batter will thicken a bit. Grease, line, and dust a 9 inch round cake tin. Preheat the oven to 175 degrees C.
Add baking powder and baking soda to the batter. Mix well. Pour batter into the prepared pan. Sprinkle pistachio slices on top. Bake for 45-50 minutes or until the top turns golden and a skewer inserted in the center comes out clean. Remove from the oven, cool on the rack. Pour citrusy honey evenly on top with a spoon while the cake is warm. This cake is special to me. Special because the recipe is mine. 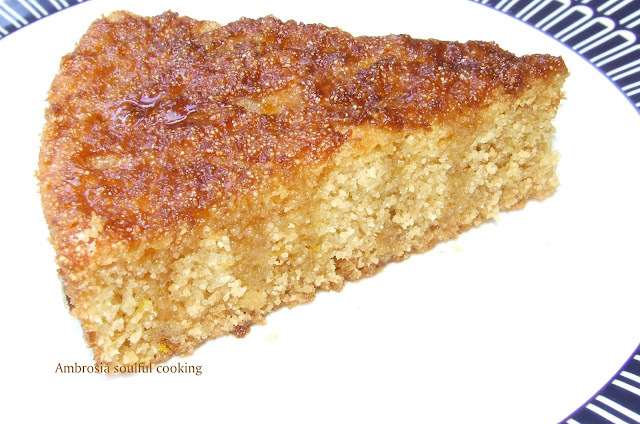 Last year when I baked SEMOLINA BANANA CAKE, I forgot to add 2 tablespoons of oil which was a part of the ingredients. I assumed that the cake would not bake well. Quite contrary to my assumptions, the cake came out beautiful. It rose well and tasted great. It was Eggless and fat less cake. Since long I was toying with the idea of baking an orange cake on similar lines. After finalizing my recipe, I baked it yesterday. The cake came out very well. Fragrant and delicious with every grain of semolina becoming juicy and bouncy. 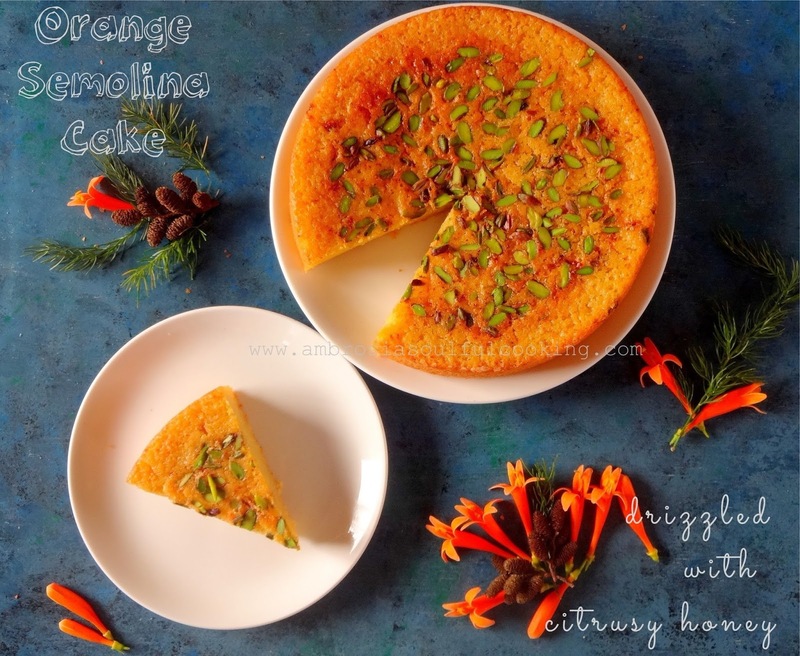 To enhance its flavour and to make it moist, I poured honey mixed with orange juice on the cake. It was just out of the world. You have to make it and believe that it is fatless. Roast semolina on low flame till a pleasant aroma emanates and it begins to change colour. Keep it to get cold. Beat yogurt until smooth. Add sugar, orange juice, vanilla extract, and zest. Add semolina to wet ingredients and mix well. Keep it for half an hour. The semolina grains will become soft and the mixture will thicken a bit. Grease, line, and dust a 9 inch round cake tin. Preheat the oven to 180 degrees C for 15 minutes. Add baking soda, baking powder and salt to the mixture and mix well. Pour the batter into the cake tin and bake for 35-40 minutes till the cake shrinks from the sides, the top becomes golden and a skewer inserted in the center comes out clean. Remove from the oven after ten minutes. Invert on the rack and remove the lining carefully. 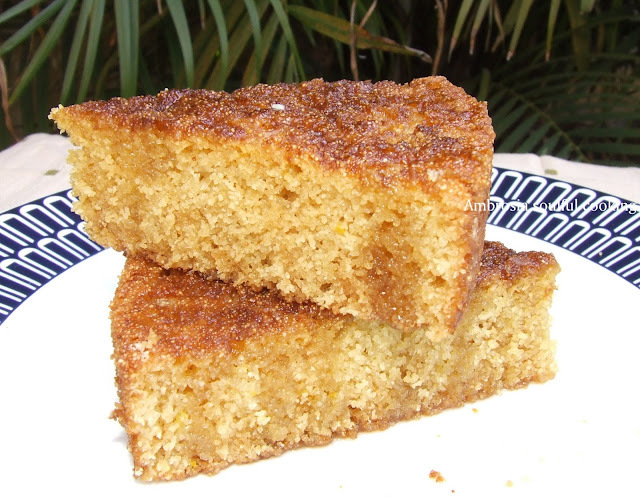 When the cake gets cold, poke the top with a fork or skewer, pour honey and orange juice mixture evenly. My notes: I used store-bought curd. If you are using the curd set at home, start with ¾ cup. Add more if the batter is thick. Hi Namita....tried this one yesterday...turned out well...had a query...the upper crust was bit sticky..was wondering what could have possibly gone wrong.. Thanks for visiting my blog and trying out this recipe. Sheetal, the cakes that are egg less and fat less tend to have a very soft, almost moist crust. In fact crust sticks to the knife while slicing. However,if you pour the syrup a little before serving, it might not be so sticky. Can we use readymade orange juice (REAL or other brand) instead of fresh orange juice? Hello, yes, if you do not have fresh orange juice you may use readymade juice. Fresh juice however tastes better. Happy Baking! Hello Cynthia, the cake does shrink from the center. But if your cake has sunk visibly, then one reason could be that the batter was too liquidy. You may add orange juice just to get the right consistency of the batter. It should not be runny. It should be pourable.Hope this helps. Love! I share your love for healthy cooking. Was lucky to come across your blog. 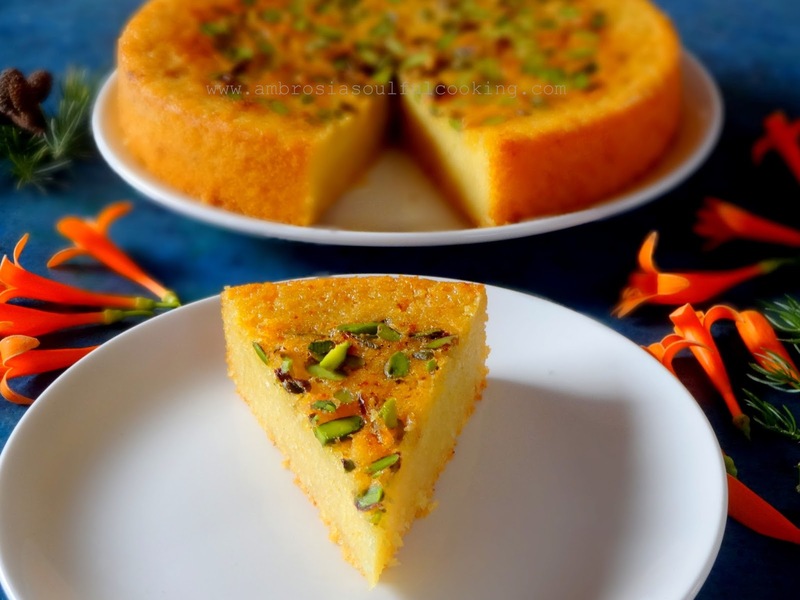 I loved the idea of using semolina for baking. Tried your semolina banana cake recipe. Came out great. I added half jaggery and half sugar, to make it healthier. Next I tried stewing grated apples and added honey as sweetener and followed the same recipe. Perfect! Can't thank you enough for inspiring me to bake. Keep it up!! Hello Sudha, you seem to be creative genius. I loved the idea of adding stewed apples and honey. This would be a really healthy cake. Thank you for your kind words Sudha! 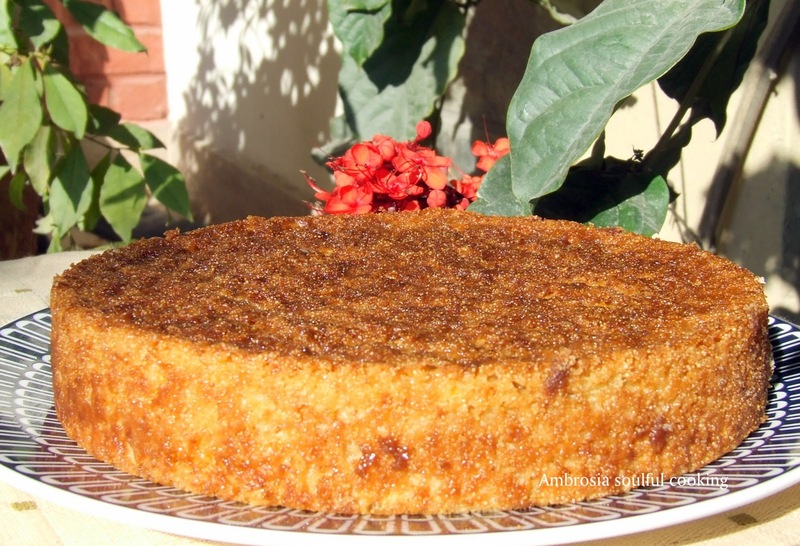 Hi Namita, thank you for sharing this recipe; the cake looks wonderful! Could I halve the measurements for a smaller cake? Hello Prathima, For a small cake, just halve the ingredients. That would be perfect for a small cake. Happy Baking!